United States ambassador Kevin Whitaker has threatened to cut aid to Colombia unless the powers of the country’s war crimes tribunal are curtailed, according to newspaper El Espectador. The newspaper talked to almost all senators and house representatives who were present at the two breakfasts at Whitaker’s mansion in Bogota, despite the ambassador’s request to maintain confidentiality. According to one of the senators present at a private meeting on April 1, the ambassador threatened the US could pull the plug on financial aid if Congress did not remove the war crimes tribunal’s power to shield demobilized FARC leaders from extradition as agreed in a 2016 peace deal. He said that if Congress did not approve the extradition [clause], the United States could take steps, such as ending to send $500 million in aid to the country. The ambassador said his government was Colombia’s largest benefactor and that since 2016, when the agreement was signed, they have contributed US$1 billion, which would be put at risk if the US’s main interest in Colombia, extradition, was affected. [Senator Ivan] Marulanda replied that Colombians cared more about peace in their country than American money. The JEP currently has the powers to test evidence before allowing extradition to shield demobilized FARC leaders from being extradited on possibly bogus claims. The court’s powers were put to the test in April last year when the US requested the extradition of FARC leader “Jesus Santrich” on an unsubstantiated drug trafficking charge. The April 1 meeting with the senators went relatively well because Whitaker had invited mainly conservative and far-right senators who already opposed the war crimes tribunal. But a second meeting with the members of the House Commission that was studying Duque’s controversial objections to the JEP’s statutory law did not go down well at all. 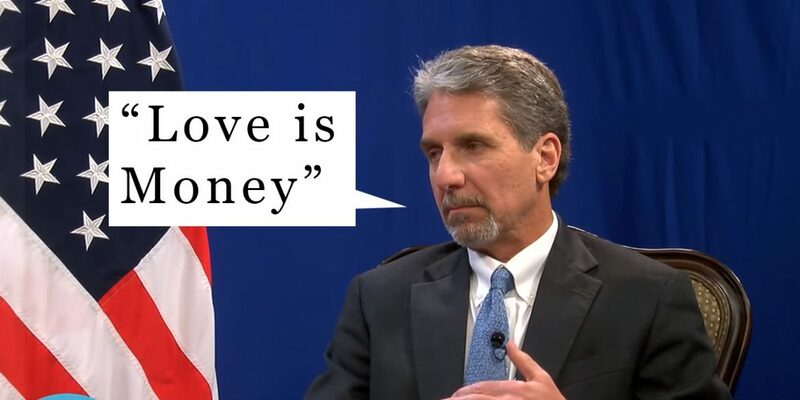 Also in this meeting the ambassador threatened to cut aid to Colombia because, according to Whitaker, “love is money,” on representative said. Five of the six representatives present at the meeting told El Espectador that the ambassador’s attitude became “intimidating” and “hardly diplomatic” after the lawmakers defended the war crimes tribunal’s power to keep war criminals accused of thousands of crimes against humanity in the country. Representative [John Jairo] Cardenas explained the reasons why he opposed the objections, arguing legal and not political reasons. From that moment on, the atmosphere became tense and even, with a whiff of arrogance, he rebuked Cardenas saying: ‘I don’t understand what this silly stuff is about’. So, Jose Daniel [Lopez] spoke and pointed out the principle of separation of powers and then the ambassador’s tongue slipped, saying: ‘Don’t bother me with legalities’. Then he brought up the issue that the United States’ affection for its friends is expressed with money. ‘Love is money’ was the phrase he used. The lawmakers initially agreed to to the ambassador’s request to keep the meeting confidential, but changed their mind after Whitaker’s allegedly rude efforts to defend his country’s interests against that victims of the armed conflict who have claimed that Washington’s extradition policy has already frustrated justice for hundreds of thousands of victims of war crimes. The US government’s… policy of inaction… has led to the obstruction of attempts made to continue with human rights investigations in Colombia. The result is at least 239,758 Colombian victims who remain without truth, justice and reparation. The president of the Constitutional Court, which was supposed to have dinner with the ambassador that evening, called Whitaker to tell him they would not accept the invitation. The ambassador subsequently withdrew the invitation. Days later, against the US ambassador’s will, the House of Representatives dismissed the objections of Duque and Whitaker and voted to return the war crimes tribunal’s statutory law to the presidential palace for signing. The Senate is expected to do the same as soon as its president, far-right Senator Ernesto Macias, decides to put the vote on the legislative agenda.